Preparation time: 45 minutes. Baking time: 14–16 minutes per pan. Preheat oven to 375ºF. Coat two baking sheets with cooking spray and set aside. In a small bowl, mix together cheese, garlic powder, and oregano; set aside. Prepare hot roll mix dough according to package directions (the dough does not need to rise). On a clean, floured surface using clean, floured hands, divide the dough into four equal portions (a sharp knife or pizza cutter works well to cut dough). Shape each portion into a ball. Take one dough ball at a time and divide it into four equal pieces (for a total of 16 pieces). Roll each piece into an 8-inch rope. On a floured surface, pat each rope out until it’s 1 1/2 inches wide. Sprinkle each lightly with cheese mixture. Fold each rope over lengthwise and pat to seal. (You now have sixteen 8-inch dough ropes stuffed with cheese.) 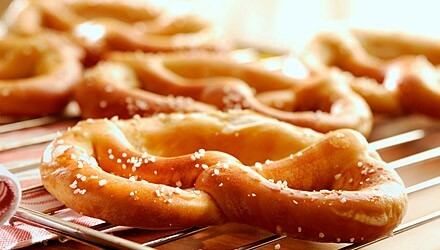 Place dough ropes on baking sheets and twist into pretzel shape (pretzels do not need to rise). In a small bowl, whisk together egg white and water until frothy. Brush pretzels well with egg white mixture (this helps the pretzels brown during baking), sprinkle with salt, then poppy seeds. Bake for 14–16 minutes, or until golden brown (watch closely during last few minutes of baking). Transfer to a cooling rack. TIP: Try warm pizza sauce for dipping.